BOISE -- Boise Police are asking for the public's help in locating a local businessman who hasn't been seen in almost two months. 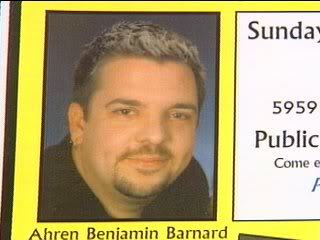 Ahren Barnard, 35, of Boise was reported missing Dec. 4, 2004. Police says Barnard is a gun dealer and frequents gun shows. He has also worked in strip clubs as disc jockey and has been known to carry weapons. Barnard does have an outstanding warrant out for his arrest on an Ada County battery charge. Detectives say they have not found any evidence of a crime, but because of Barnard's activities, his disappearance is considered suspicious. Police would like to hear from anyone who has information about Barnard's whereabouts since Dec. 4. Anyone with that information is urged to call Crime Stoppers at 343-COPS. A missing person case more than two years old has police more concerned than ever. Ahren Barnard went missing on a Saturday in December of 2004. Police say what's causing them concern is that they've found no trace, no clues about his disappearance. I just wanted to let you know that after nearly 2-1/2 years the Idaho Statesman finally allowed me to buy an ad regarding my son's disappearance. As a result of the ad, KIVI Channel 6 News picked up the story and ran a segment on his disappearance. We've been unable to get any media coverage up until now, so this was a very good thing. Please, if you will, take a look at it, and forward this email to all of your friends, asking them to do the same. It is important to get his picture to the public nationwide, and especially in Boise where he disappeared. If you haven't viewed his web page, I invite you to visit it and sign his guestbook at www.helpfindahren.com. You can also download a poster to display in your car, store front, office cubicle or community bulletin boards.We've also created a website at www.myspace.com/ahrenbarnard. I know you are all busy, but I am desperate to find my son and end this nightmare, and could use the help of friends and family. Mother of Missing Ahren Barnard (Benjy)"
It's been three years since Ahren Barnard disappeared from Boise, literally without a trace. Now his mother, Vicki Barnard is in town to lead a vigil this weekend, hoping it will help bring answers. "I don't know if he's dead or alive. But I do know in my heart that there are people in this valley that know what happened to my son," Bernard told Today's Channel 6 News. Ahren was 35 years old when he vanished without a trace on December 4, 2004. He was last seen dropping of his son at the McDonalds on Cole & Overland Roads. "He was going to pick him up the next morning to complete his visitation weekend, but he never showed up," Vicki said. "So that was very, very odd. That was our first indication that maybe something was wrong. She is certain her son would not have left without telling anyone. Ahren's truck was deserted in his driveway, and his pets were abandoned without food or water. "I have tried to open my mind to all the possibilities out there. But I can not say for one second that I've believed that he left on his own," she said. Vicki has always feared that fould play was involved in her son's disappearance, but Boise Police have never found any real proof of that. The case is still classified as "highly suspicious." "Detectives may have hunches. They may have gut feelings. But what they need is evidence," said Boise Police spokeswoman Lynn Hightower. So Vicki has made it her life's mission to find out what happened to Ahren, doing what she can to keep his dissapearance in the public eye. She is organizing a vigil for Sunday, December 4th. It's scheduled to begin 7:00 p.m. at the YMCA West on Discovery Way in Boise. There will be a candle lighting and balloon release outside, weather permitting. When Ahren went missing, he was 5'10", 180 lbs, with black hair and brown eyes, and a scar on his lieft arm. If you have any information about Ahren's disappearance, please contact Boise Police at (208) 377-6500. He may be driving a green Land Rover sport utility vehicle (SUV) with temporary Idaho license plates. From where does this info come, I wonder. Sorry, Laga..I forgot the link. It is there now. BOISE, Idaho - Police say an anonymous letter further fuels the belief that foul play may be involved in a missing man case that's seven years old. Ahren Barnard vanished without a trace at the age of 35. He was last seen at the McDonald's at Cole and Overland Road Dec. 4, 2004. "The more information we gather, the more we believe foul play is involved here," said Sgt. Mark Barnett of the Boise Police Violent Crimes Unit. "Information received through an anonymous letter recently appears to be relevant to the case and gave detectives new leads to follow," Barnett said. "That letter seems to validate what we've thought all along, that there are individuals who have information on this case who have not yet come forward." Police did not say what was said in the letter. "I believe someone murdered my son," Ahren's mother, Vicki, told KBOI-TV last year. "I believe there are a number of other people out there that know where the body is. I want them to come forward and end this nightmare." Anyone with information about this case is urged to call Crime Stoppers at 343-COPS.